I love wine and I am also a gadget freak. 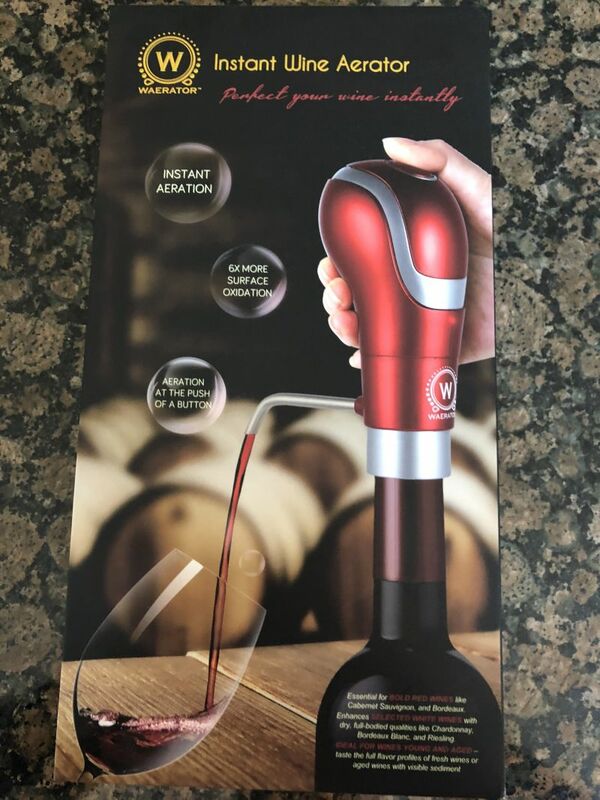 I was, therefore, excited to receive a Waerator Instant Wine Aerator for us to review. It is an electric device that is intended to breathe wine, exposing the wine to oxygen. The best way of doing this is to open a bottle several hours before you wish to drink it and decant it. I do not know how you feel when you get home from work on a Friday evening, but I would rather not wait another four hours before my first sip of wine. Therefore, the idea of a device that allows me to open and drink from the bottle right away while gaining the benefits of having the wine breathe, is very appealing. The box is solid but looks rather fussy compared to the uncluttered aesthetic I associate with the gold standard of packaging, Apple. The box is sealed with two small stickers and top and bottom that are easy to slice. Inside are fours pieces; a handle, two tubes of different lengths, and a user manual. The handle twists open so that four AAA batteries can be added. The tube plugs into the bottom of the handle. The manual recommends that you wash the device before using it for the first time. To clean it, you need an empty wine bottle, which in our home was not hard to find. Fill the bottle with water. Insert the Waerator Instant Wine Aerator into the bottle. Press the button and water will be pumped from the bottle and through the device. 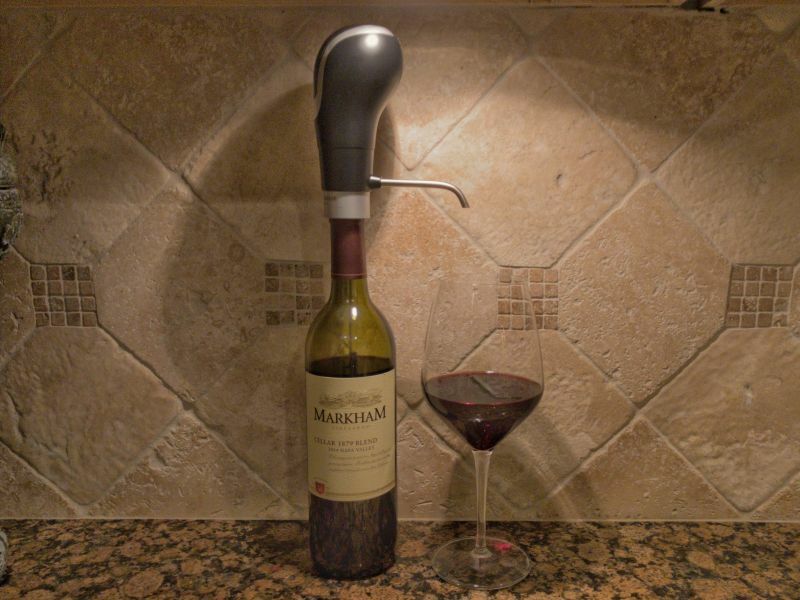 The manual suggests placing a glass beneath the spout but it seemed easier to stand the bottle in the sink. This process needs to be repeated three times. I then allowed the device to dry for a couple of hours, as I did not want water in my wine. I opened a bottle of 2014 Markham Cellar 1879 Blend. Markham is a winery that sits on Highway 29, North of St Helena. The 1879 blend is a wine that they make available via retail. It costs less than $20 at Safeway. I poured two tastes into identical Luigi Bormioli Atelier Cabernet/Merlot Luigi Bormioli. The first taste was poured immediately after opening the bottle. I then inserted the Waerator Instant Wine Aerator into the bottle, pressed the button, and wine flowed into the glass. I inhaled from the first glass; found a tight nose, with but the barest hint of fruit. The second glass had a more intense and varied bouquet, with rich cherry notes. Neither glass had a great aroma, but there was no doubting that the aerator had worked to open the nose. Then I took a sip from the first glass and encountered tannin and acid, with dust and some cherry. The second glass had the bitter cherry far further forward and the balance with the acidity was significantly better. An hour later, I returned to the glasses. The glass into which I had poured the wine was still noticeably tighter than the one with wine passed through the gadget. The aerator acts like a stopper, so the wine is still in good condition the following day. It will stop pumping wine when there is an inch or so left in the bottle. You can remove the device and pour the last of it into your glass. The manual only mentions cleaning the device before first use but it seems to me that it should be cleaned after every use. There was some red wine left in the bottom of the tube, which I would not want contaminating the next bottle I breathe with the gadget. I used the same method as I had when first unpacking the device; with the now empty bottle of Markham wine. 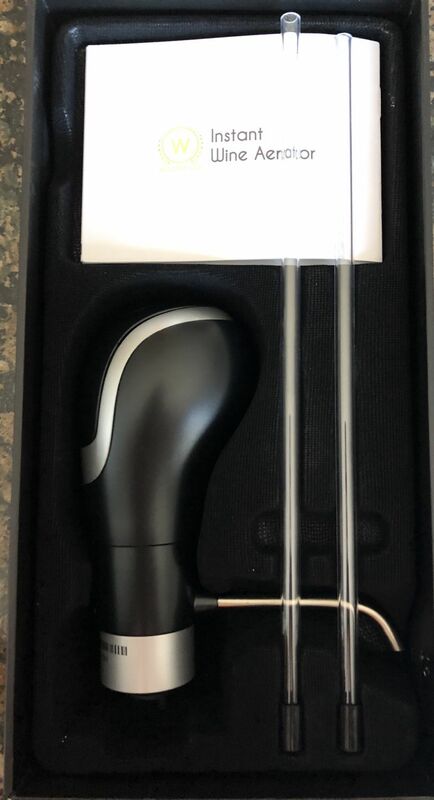 Full details about this device, which we received as a free sample for review, can be found at their https://waerator.com. The Waerator instant Wine aerator is available from Amazon. It is also available in red. It sells for $59.99 or £49.99 from Amazon in the UK. Sounds interesting, I’ll have to look into getting one and trying it out for myself!